But do not fear, there are steps you can take to get your dog through the ordeal. The two key elements are to understand your dog’s needs and establish a good routine. Conservative treatment for an IVDD episode (Intervertebral Disc Disease). This includes recovery from a bulging or ruptured disc. Dogs with these conditions can be placed on restricted movement for up to 6 – 8 weeks. During that time, it is important to follow your veterinarian’s orders. You will be tempted to open the gates early when you see your fur baby’s sweet face peering out from behind the bars, but resist the urge. Letting them out too soon is the number #1 cause of reinjury. Instead of freeing your dog; your goal should be to make their temporary home as calm, comfortable and enjoyable as possible. How to pick the best crate style. Crates come in a variety of styles, but before we discuss them, here is an important rule to remember. Choose a crate that is big enough for your pup to stand up, turn around in a small circle, and lie down comfortably. Metal crates – These are sturdy wire enclosures that have a solid floor for your dog to rest. They are easy to clean, provide good protection and usually fold up when you no longer needs them. Wood crates – This type of crate is built to look like a piece of furniture. It is comfy and provides good protection. It is a great choice if your dog needs ongoing confinement or might require recurring periods of crate rest. X-pens or playpens – These are durable metal wire pens that give dogs more room than the typical wire crate. They do not have a floor or a top covering so owners need to be sure the walls are tall enough so your dog cannot jump or climb out. X-pens give your dog more room while still being safely confined. They are great for big dogs. The pen folds up when you no longer need it. Soft-sided crates – These are not my first choice for extended use, but if you have a small dog and limited space, they can be a good choice. The crate is made of a soft material top and floor with mesh side walls. They are lightweight and easily transportable. Make sure the crate allows for plenty of circulation and air flow. Check the temperature in the room where the crate is located so it isn’t too hot or too cold. Add a blanket or crate mat if you think the flooring or room temperature might get cold. 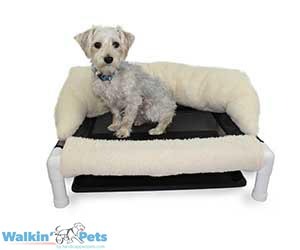 Add an orthopedic dog bed to prevent pressure sores from developing. Put down puppy pads in case of an accident. Ensure all padding and bedding is Vet-approved and properly aligned. Place the crate in an area where it won’t get bumped. Corners are great for this. If time allows, introduce your pet gradually, in short periods. Give clear instruction to all family members and visitors about your pet’s needs. Post a sign outside the crate as a reminder. Post a Be Quiet sign at your front door. A ringing doorbell can cause your dog to jump and bark. Remove any correction collars that might get caught in the wires of the crate. Add toys that will entertain and stimulate your dog’s mind. Sturdy chew toys and food dispensing toys are great ways keep a dog from getting bored. An ex-pen (playpen) dog crate. You might receive special instructions if your dog is recuperating from surgery. Dodgerslist, for dogs with IVDD recommends, “Your Veterinarian may require a flat, always horizontal and firm surface” with no bedding and minimal contact. Ask your veterinarian for recommendations on a weekly basis about activities you can add to their routine. As they become more mobile, you may be able to move your dog from a small space to a larger “Recovery Suite” like an ex-pen. Or maybe light rehab exercises can be added. Some veterinarians also prescribe herbs to keep dogs calm or suggest a diffuser that sends calming scents into the crate. It is important to set a daily routine. If your veterinarian allows your dog to go outdoors, schedule 3 – 5 bathroom breaks each day. They should be as soon as your dog wakes up in the morning, after each meal and before bedtime. Dogs can be carried or walked outside on a lead. Keep each break to no more than 5 minutes of outside time, especially during the first few weeks of rest. The final part of your routine should include scheduled “fun time” where you interact with your dog. It is easy to see yourself solely as the caretaker and your pet as the patient. Setting aside a quality activity will remind both of you of the bond you share. During rehabilitation, a dog’s mind needs to stay active to keep boredom at bay. Simply spending time on their level, speaking to them and reminding them ‘this too shall pass’, will ease their worries. Dogs are like people, when hurt they want to feel someone is watching out for them and empathizing with their pain. Keeping them engaged in life, will give them a sense of security and peace. The key to successful crate rest is to put yourself in your dog’s paws. Imagine going from rambunctious playtime in the backyard to being told you are in ‘time out’. Not so fun. Treat your pet as you would wish to be treated after surgery or a trauma and I promise the road to recovery will go smoothly. This post contains some affiliate links to crates described in this post that are available on Amazon. If you make a purchase this blog receives a small fee at no additional cost to you. Looking for a dog bed that will keep your incontinent dog dry all night long?